There's no denying it — there's nothing quite as beautiful and modern as Mark Rothko's style. His abstract pieces contained minimal style and deep, reaching colors. The In Love with Spring Ketubah captures that style and sets the scene for a beautiful Spring day. With pastel pinks and powder blues, this work of art features the best of Ketubah tradition and modern design! This Ketubah is perfect for the couple that loves modern design, but with a unique twist. The beautiful blooming tree brings out a softness to this design and looks stunning next to the Ketubah text. 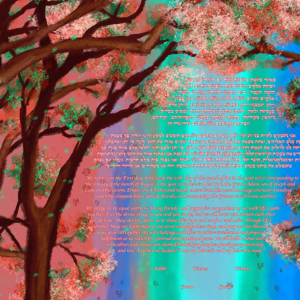 The In Love with Spring Ketubah will be the perfect design to represent your new life together and ever budding love! 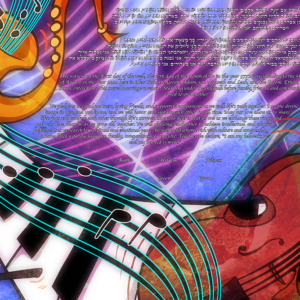 With tons of detail and vibrant colors, the Concert Lights Ketubah truly bursts with excitement and life! 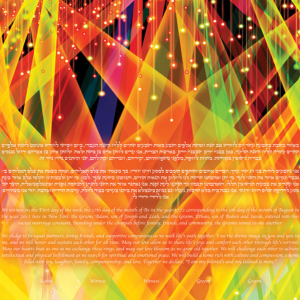 This Ketubah captures the thrill of your favorite concert or show — flashing lights, lots of color and amazing music. The Ketubah text placed right in the middle brings a central focus and emphasis to the most important part of this stunning design. 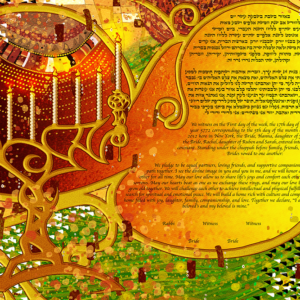 The firey orange and yellows overlap each other perfectly to illuminate and bring together the entire Ketubah seamlessly. There’s nothing like the world of music to evoke and illustrate a certain kind of emotion. The Concert Lights Ketubah is perfect for the couple that attends their favorite concerts and shows religiously, and truly bond over their favorite music groups! This stunning Ketubah will be a reflection of your beautiful commitment and a lifetime together, filled with music and love. Ready… Set… Go! The Love Race Ketubah captures the fun style of those old school video games and youthful days of going to the arcade with your friends. 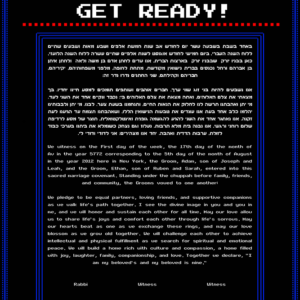 With the “2 Players Press Start” button at the bottom and the “GET READY!” phrase at the top, this Ketubah features a classic video game screen, but altered a little bit to fit the Ketubah tradition. The retro font and colors adds a fun style to this design, while the pixelated heart adds a subtle touch of romance and love. The Love Race Ketubah is perfect for the couple that spends their weekends trying to beat that next level and definitely enjoy some of the old school video game favorites like Atari and Pac-man. This design beautifully represents the significance of marriage and going to that “next level” in life. Although this new level is filled with new challenges, it’s also filled with new exciting adventures — an adventure definitely worth pressing “Play” for! The Hamsa Pop Ketubah takes the iconic style of Andy Warhol and blends it with the Ketubah tradition — creating a work of art that is beautiful in both design and meaning. 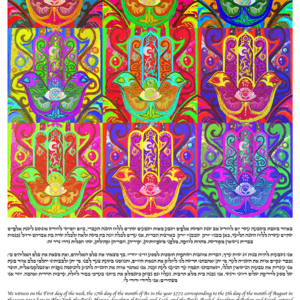 This Ketubah features a stunning hamsa in a square pattern, each square containing a different color pattern of vibrant colors. 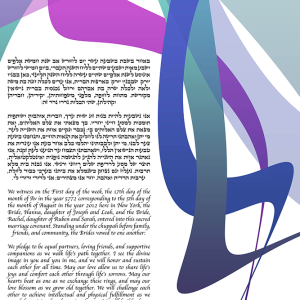 The white background makes the design truly come to life and works to bring emphasis on the Ketubah text below. With tons of color and an edgy style, this Ketubah is perfect for the couple that loves the blend of retro pieces with modern simplicity. The decorative hamsas are a beautiful reminder of the importance of tradition, while the fun, Pop Art style shows how tradition plays out in your everyday life, relationships, and marriage. The Hamsa Pop Ketubah will be a stunning centerpiece in your new life together — a life filled with laughter, adventure, and love. Between the swimming dolphins and turquoise and orange color palette, it's not hard to guess this Ketubah's inspiration — the Miami Dolphins football team! 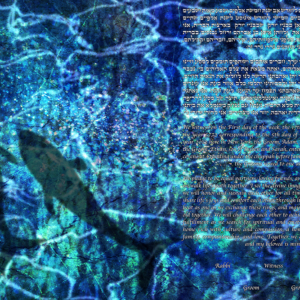 The Dolphins Ketubah features a giant sun framing the text with two dolphins below. This Ketubah gives a nod to your favorite football team, while still containing its' own beautiful style and design. 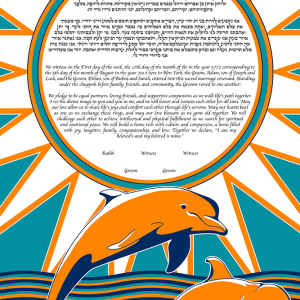 This Ketubah is perfect for the couple that loves to get excited for a common purpose, whether you're a die hard fan of the Miami Dolphins or just have a special pride in the Sunshine State. The Dolphins Ketubah represents more than just you and your partner's passion for your home state or favorite team — it's a design that captures your love for life, and more importantly, each other. This work of art will be the perfect vibrant centerpiece in your home and relationship! 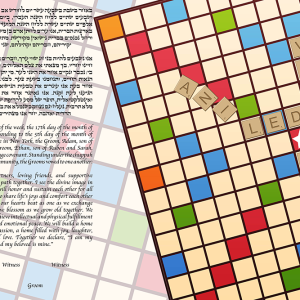 With tons of color and a fun style, this Ketubah is inspired by every inner word nerd's favorite game — Scrabble! This design features a Scrabble board spelling out the word “Ani LeDodi VeDodi Li”, or “I am my Beloved's and my Beloved is Mine”. 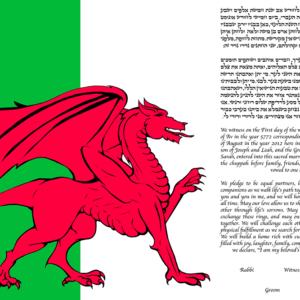 The text to the left and the lighter background adds a dynamic depth and beautiful layout to this already unique Ketubah. The Scrabble Ketubah is perfect for the couple that not only loves Scrabble, but words in general. Whether it is word games, riddles or even learning a new language — solving and conquering a new challenge is where you both thrive. 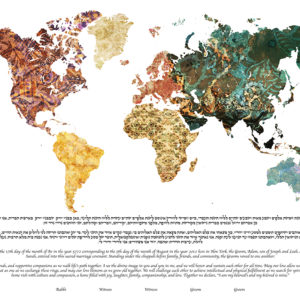 This Ketubah will be the perfect unique design to represent your life together — a challenging ride filled with ups, downs and lots of laughs!